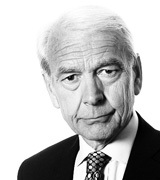 John Humphrys - The ‘End of Austerity’: But How? October 05, 2018, 2:30 p.m.
Theresa May said this week that ‘the end of austerity’ is in sight. She told the Conservative Party conference that if a deal on Britain’s withdrawal from the European Union next March could be agreed, her government would be able to ease the pressure on public spending. There would be a ‘deal dividend’ and austerity would come to an end. But Mrs May is also on record telling voters at the election last year that there are no ‘magic money trees’. So how is an end to austerity going to be paid for? There is little doubt that the impetus behind the Prime Minister’s declaration was primarily political rather than economic. We know that because she said so herself: ‘The British people need to know the end is in sight and our message to them must be this: we get it’. It was actually something of a political event that Mrs May used the word ‘austerity’ at all. Rather in the way that Margaret Thatcher always refused to call the poll tax the poll tax and insisted on calling it ‘community charge’, so Mrs May and her party have avoided the term ‘austerity’. That’s the word her opponents used. She preferred the expression ‘reducing the deficit’. In fact the word ‘austerity’ has meant different things to different people at different times since we were plunged into it after the financial crash ten years ago. The effect of the crash was to produce a sharp recession which put paid to the expansive plans for public spending first laid out by Gordon Brown’s government and which the then opposition Tory leader, David Cameron, had said he was broadly happy to go along with should he come to power. Instead both were faced with a fiscal crisis. The recession added to the pressures on government spending while also slashing tax revenues, with the result that the government deficit – the excess of its spending over its revenues – soared. By 2010 the deficit was running at around 10% of national income a year, and these accumulated deficits added to the total of outstanding government debt. It more than doubled as a percentage of national income, approaching 100%, an exceptionally high figure in peacetime. Everyone agreed that the deficit would have to come down. The argument was about how quickly it should be attempted. After 2010, Labour, now in opposition, said the new coalition government was trying to do it too quickly. For the first time it called the policy of sharp cuts in public spending ‘the policy of austerity’. The Conservative chancellor, George Osborne, retorted that this just showed Labour wasn’t serious about ‘reducing the deficit’ But his actions did not mimic his words. He covertly followed their advice and slowed things up, with the inevitable result that ‘austerity’ spread out over a longer time. So it’s only now, ten years after the crash and eight years after the Tories came back into power, that the deficit has been reduced to 2%, a figure that most observers would regard as sustainable, though the Tories still want to eliminate it altogether. In economic terms, therefore, Mrs May is justified in claiming that ‘the end of austerity’ is in sight: the deficit has been reduced to manageable terms. But most people don’t think of austerity in the dry economic sense of a policy designed to reduce a particular statistic to a number that can be lived with. To them, austerity simply means ‘cuts’, the cuts to the public services they have been enduring for the last decade or the freeze on their pay if they happen to work in the public sector. The arithmetic is simple enough. If a government wants to reduce its deficit it must either raise taxes, cut spending or do both. The Tories have done both but they chose to let spending cuts take the bulk of the strain. In real terms spending by departments overall fell by over 14% between 2010 and this year, and as a proportion of the national income spent on them, it was cut by 28%. Some individual departments have been hit much more savagely and even those services that are supposed to have been protected, like health, have felt the effect because they no longer enjoyed the big real increases in spending they had become used to and which, in a world of increasing demand, they needed just to stand still. Most public sector workers had their pay frozen until very recently. So now people will think ‘the end of austerity’ means ‘the end of cuts’, and then the restoration of some of the old spending. Public sector workers will certainly think it means more pay. And in political terms that is what Mrs May wants people to think because she believes it would be politically suicidal for the Tories to allow Labour to claim that they alone would put an end to the public spending squeeze. Voters must know that the Tories are on board for that too. She told her party conference: ‘A decade after the financial crash, people need to know that the austerity it led to is over and their hard work has paid off’. But there are still further cuts in the pipeline (including in welfare benefits). So where is the money going to come from if these are to be stopped and the spending increases all government departments are clamouring for are to be accommodated even to a small degree to honour the promise that austerity will end,? The most blithe answer to this eternal question is always the same: from economic growth. And the answer is superficially correct. If an economy’s rate of growth can be increased, then there is more tax revenue and so more money for governments to spend. Bingo! But you first have to be sure you get the increased growth otherwise, if governments just assume it, they are simply signing a blank cheque. That’s why Mrs May was very careful to say that the end of austerity was dependent on securing a withdrawal agreement with the EU. Recently the governor of the Bank of England, Mark Carney, gave a chilling forecast to the Cabinet about the economic effect of a no-deal Brexit, involving a big short-term hit to economic growth. And it’s why the Chancellor, Philip Hammond, talked this week of a ‘deal dividend’, of being able to start the ending of austerity via the boost to economic growth he believes a deal on withdrawal would bring. But such are the uncertainties of Brexit that the Treasury will dig in its heels against any idea that the end of austerity can be financed by the mere hope that the economy will start growing faster. Another solution would be to increase borrowing. Some would argue that now the deficit is down to 2% the government can start borrowing again, especially as interest rates remain historically very low. The Prime Minister showed some enthusiasm for this when she announced the removal of the cap on how much local authorities can borrow to build council houses. But there are limits here too. Although the deficit has been slashed, the total amount of government debt, at 86% of national income, is still very high for a country not at war. The problem is that no one has succeeded in ridding modern economies of the cycle of boom and bust and many observers think history is about to repeat itself. There are signs that some of elements of financial recklessness that caused the crash ten years ago are being indulged in yet again with the risk that they may send the economy crashing once more. After the 2008 crash the government faced having to increase its deficit hugely in the context of an outstanding debt burden of only 36% of national income. It will be much harder to do it from a starting point of 86% or higher. That’s why many will urge the government not to try to end austerity with a massive increase in borrowing. That leaves only increased taxation as the means of ‘ending austerity’ in public spending. Earlier this summer Mr Hammond hinted at the need for increased taxes to pay for the increased spending on the health service already announced. But Mrs May seems nervous about pursuing this line. At the Tory Conference this week she promised to go on freezing fuel duty for the ninth year in succession. In any case increasing taxes is not a natural Tory thing to do and is as much a fault line in internal Conservative Party dispute as Brexit is. In his conference speech, widely interpreted as a direct challenge to Mrs May’s leadership, Boris Johnson not only savaged her Brexit policy but also advocated committing the party to no tax increases at all. Such a policy would put paid to ending austerity by this route. But the political fact facing all parties remains the same: the public has had enough of ‘austerity’ and wants curbs on public spending and on public sector pay to be relaxed and for spending to start rising again. Some opportunity for that may come from a ‘deal dividend’ and from a less stern attitude to borrowing. But in the end public spending has to be paid for by taxation. Are increased taxes what we mean by an ‘end to austerity’ and is it what people want?